For the second year now, I’ve been providing the teas for a stunning garden in Radcot, just outside Faringdon. Set down by the pond, based in the summer house which I bedeck with summer bunting, I serve an array of cakes with tea and coffee to hordes of hungry garden enthusiasts. I also run my coffee shop at the monthly auctions at the Kidson-Trigg Salerooms in Highworth, Wiltshire where I sell yet more cakes but even more bacon sandwiches! 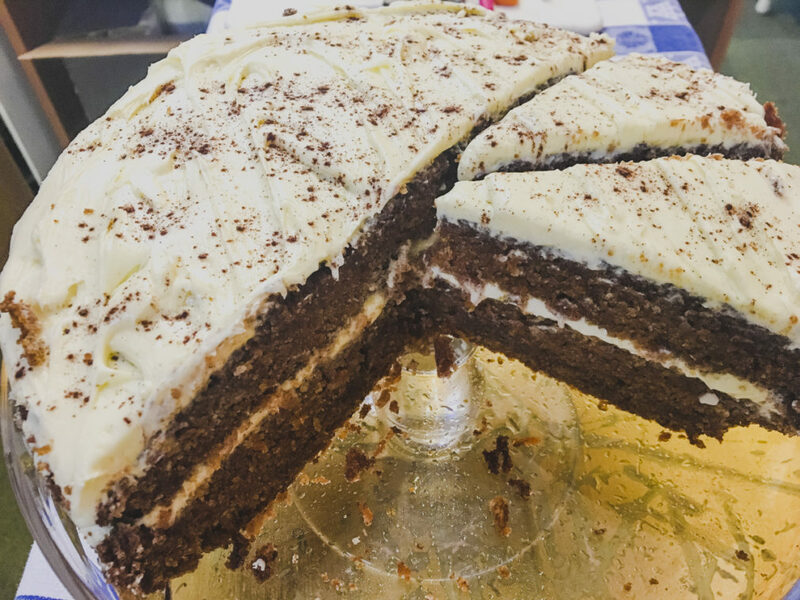 The cakes which are proving really popular at the moment are the gluten free versions of our favourites, and they taste just as good. Why not try them at home and see for yourself? 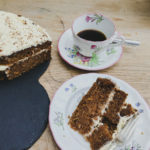 Both these cakes make excellent puddings too – so why not add an indulgent scoop of ice cream or even better, some warming custard when you serve them up! I’ve adapted this recipe from the Ballymaloe Cookbook. The original recipe calls for a little less than the quantities I’ve used here, but I have multiplied them by 1.5 in order to fit my rather battered but brilliant 23cm cake tin, which I grease and then line with parchment. It is important to note that this cake goes into a COLD oven!! If you’re planning on making more than one cake, just make sure you get this one cooked first! Add the eggs to the oil in a jug, whisk together and pour into the dry ingredients and mix well. 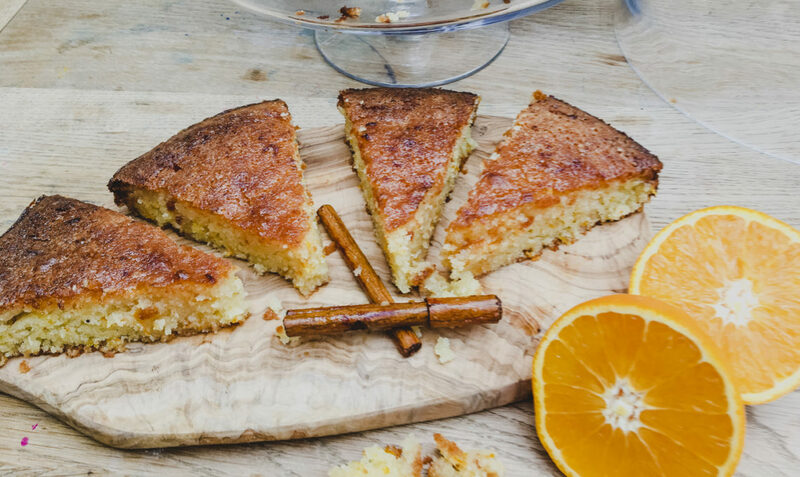 Add the zest of the oranges and lemon and mix again, then pour into the prepared cake tin. Put the tin into a cold oven, turn it onto 180C/160C fan, gas mark 4, and bake for 45-55 minutes. While the cake is cooking, mae the syrup by combining all the syrup ingredients in a small pan. Stir slowly over a gentle heat to dissolve the sugar, then bring to the boil, turn down and simmer for 3-5 minutes until syrupy. When the cake comes out, make lots of holes all over the surface and pour the syrup in. 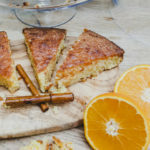 When it is cool and ready to serve, I removed any stray cloves and put the cinnamon sticks in the centre of the cake. Preheat the oven to 170C/325F/Gas Mark 3. Grease and line 3 x 20cm cake tins. Blend the sugar, eggs and oil in a bowl - I use my trusty Kenwood Chef with the beater attachment - and don't worry, it will look slightly split at this stage! Carefully add all the dry ingredients and mix well for a few more minutes. Stir in the grated carrot and mix well and divide the mixture into the three tins. Bake for 20-25 minutes, until the cake begins to come away from the side of the tin. Leave the cakes to cool slightly in the tins, then turn them out and leave them to cool completely. Blend all of the ingredients together for at least 5 minutes, but take care not to over beat or the mixture will go runny! When the cakes have cooled, sandwich them together with the frosting and carefully dust over some ground cinnamon. Delicious!